Good! What Could Be Better? I n just about any discussion of the best reataurants in San Miguel de Allende, the name El Pegaso is bound to come up. I know it's been a staple favorite of mine for years, and I'm certainly not alone. I recently asked more than a dozen long-time sanmiguelense friends to name their favorite San Miguel restaurants, and El Pegaso was on almost every list. The prices are moderate, the service is friendly and efficient and the place is spotless. The decor is Mexican funky—with lots of color and good examples of folk art on the walls (all of it for sale). Don't leave town without checking out the cheerful little painted tin nichos made by the well-known Cielito Lindo workshop in Colonia Guadalupe. Colorful and funny, they feature Day of the Dead calaca figures in common, silly and occasionally risqué tableaux. Take one home and you'll smile and remember El Pegaso every time you look at it. 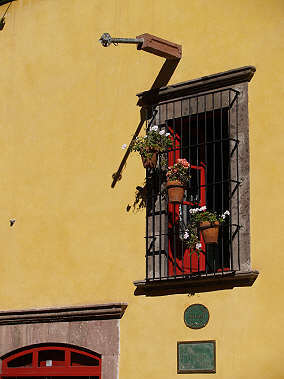 El Pegaso is a popular meeting place for expats in San Miguel, especially for breakfast or morning coffee and pastry. But Mexicans also love it. During the short film festival Expresión en Corto, you're likely to find many of the film-makers hanging out here in the evenings. This popular San Miguel restaurant is very easy to find, just two blocks from the Jardín at the corner of Correo and Corregidora. Just look for the yellow wall with the bright red door. It's owned by Robin (American) and Beto (Mexican) Díaz, and they've got both cuisines—and several more besides—well covered. You might find a curry on the menu next to an Asian dish next to traditional Mexican Chiles en Nogada, next to a big ol' juicy American hamburger. Whatever you choose, it'll be good. I've never had a bad meal at El Pegaso, which is something I can't say about several other restaurants in San Miguel de Allende. It's popular for breakfast, with a full menu including really excellent Eggs Benedict. For lunch, there's lots of salads and sandwiches as well as Mexican favorites like tamales and Chicken in Mole. Home-made soups vary from day to day; the corn and chipotle soup is quite special and the sopa azteca is one of the best in town. This San Miguel eatery is justly famous for its real Caesar salad, made table-side with all the necessary attendant flair. The anchovies are well-mashed, just the right amount of garlic, the romaine crisp, the croutons home-made, everything in perfect balance. My own long-time El Pegaso favorite dish is the Kung-Pao Chicken. It includes lots of veggies, peanuts and strips of dried red peppers. They'll happily make it as mild or as spicy as you want. Whether you're eating Mexican, American, Asian or something in between at El Pegaso, be sure to leave room for at least one of the desserts. They're home-baked and to die for! Raspberry cheesecake is a house specialty, but then you'd miss out on the chocolate cake. Oh, but leave room for pecan pie. Then of course, the lemon cake.... oh, dear. Where was that gym I heard about this morning? When you're eating out in San Miguel de Allende, look for El Pegaso, one of the best restaurants in San Miguel.